The choice of the best floor and wall coverings for the home in 2018 includes plenty of classic, evergreen materials offering the latest technological benefits. Floors for the home of 2018 tend to follow in the path of tradition, offering an unmissable opportunity for new homes and renovation projects. Porcelain permits optimisation and reproduction of the original textures of nature and goes beyond the limitations of traditional ceramic. Porcelain is one of the strongest, most dependable construction materials available today, used in top quality floor and wall coverings for indoor and outdoor use. 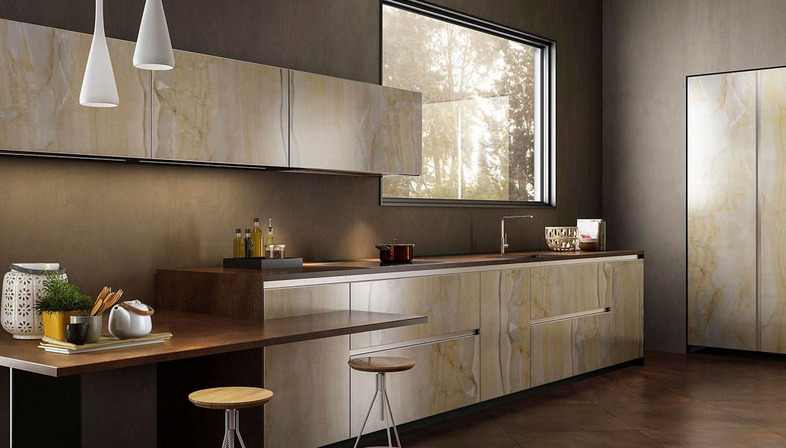 FMG Fabbrica Marmi e Graniti has added to its range of Maxfine maxi-slabs with a new selection of Onyx-effect surfaces. Presented at the 2017 International Exhibition of Ceramic Tile and Bathroom Furnishings, Onice Verde, Onice Grigio and Onice Avorio are three new textures offered in large 300x150 cm slabs only 6 mm thick, "underlining the uniqueness of this stone, its elegant combination of colours and its multitude of different hues". Three proposals for 2018 Italian design from FMG, to add to the classic Onyx-effect slabs Perla and Oro, marble-effect surfaces of great expressive and decorative value which have fascinated artisans, sculptors and architects with their timeless beauty since antiquity. With Onice Verde, Grigio and Avorio, FMG Fabbrica Marmi e Graniti faithfully reproduces the effect of natural stratification and the particular cut of a stone that is perfect for luxury designs for contract and retail projects. In detail, Onice Verde is inspired by a precious variety of onyx found in Pakistan. The slab has an olive green background with elegant stripes "exploring warm hues of beige, brown, gold and bronze". Onice Grigio is based on the flaky structure of Turkish onyx. Dominated by a grey background, it features surprising hues of green in different thicknesses ranging from ice white to deep ochre. More sombre, neutral Onice Avorio is based on a stone from the ancient quarries of Persia. Its white background stands out for its delicate hues of beige and light grey, crossing these highly versatile slabs perfect for a variety of different applications and styles, including today’s increasingly popular minimalist look.